Column: What are your county fair favorites? What are your first memories of the Crawford County Fair? Growing up, I didn’t get to the fair as often as a lot of my friends. My dad was a teacher in Galion and all of the kids — well, the boys anyway — played high school football in the fall and Little Sox, Little League, Babe Ruth and some traveling baseball in the summer. Galion was a larger community then. The Fourth of July was kind of the midway point for baseball. That’s when the all-star games were played. The season didn’t actually end until early- to mid-August. And football practice actually started about Aug. 15. That left a week, maybe two two, for family vacations. So, between baseball, football conditioning and practice and family vacations, the fair wasn’t a priority. I remember really hot trips to Florida in August. It was miserable and their were a lot of flies and mosquitoes. I remember a trip to New England where we camped and got rained on … a lot. But Boston was fun and the U.S.S. Constitution was majestic and beautiful. On that vacation — I could not have been older than 10 — even I noticed how bad the traffic was in Boston. I remember delivery trucks triple parked and police officers directing traffic at busy intersections. I also remember the House of the Seven Gables in nearby Salem. And I remember Niagara Falls and how wet it was each morning at our campsite. I don’t remember if that wetness was the result of more rain, or mist from Niagara Falls. We never made it to New York City on those trips, as my dad was either pulling a trailer or the car was top-loaded with a tent and enough supplies to feed, clothe, house and pamper 8 t0 10 of us. Another thing I rememer about that vacation was my grandmother. We brought along one of those ancient hair-dryers that plugged into an outlet and had a big hose attached to a cap she wore over her head. It still makes me smile. I still have not been to New York City. Someday perhaps. And if not, I’m OK with that. The other large, long family vacation I remember was a trip to Williamsburg, Virginia. My dad pulled a trailer for two weeks. I am pretty certain there were other stops along the way, but I mostly remember Williamsburg and the old homes and old people dressed in period costumes. I kind of remember getting stuck on some endless loop while driving through Washington D.C. I also remember Busch Gardens. I think it was our trips to Busch Gardens in Florida and Williamsburg that played a role in my love of zoos. I always enjoyed my vacations. So I didn’t miss the fair. 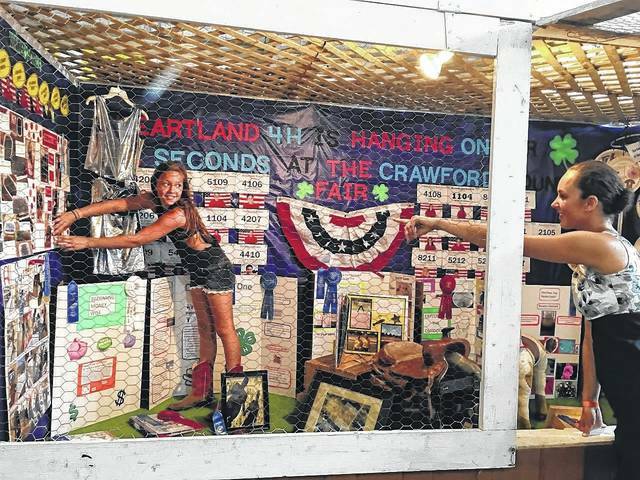 But now that I’m older, I realize I missed out on a lot of fun activities and learning experiences through 4-H and the Crawford County Fair. But I did get to the fair a few times. And I can’t remember a visit when it was not too hot. I was regular at the lemon shake trailer stand. I remember seeing bags of old used-up lemons in the trash and I remember watching the workers make those things with fresh-squeezed lemon juice and what seemed like a gallon of sugar in every cup. And for some reason, there were also a lot of bees near that stand. Still, those drinks quenched my thirst. They also amped me up and it took the rest of the day to come down from my sugar high. My tastes have changed in four decades. Now I seek out the trailers selling gyros or sausage, pepper and onion sandwiches. Oh, and french fries … with vinegar and catsup. I was a city boy, if you consider Galion a city, so I enjoyed walking through the animal barns. Except for a few field trips in elementary school, the fair was where I learned about horses — there were always cute girls in the horse barns — and goats and pigs. I also learned about chickens and steers and cows and the many different kinds of rabbits. I took many walks through the animal barns. The bigger the animal, the more I liked it. For some reason, the hog barn fascinated me. They were so big, and so pampered. Kind of like sumo wrestlers. But as much fun as the animals were, those barns also were full of odors and scents that are hard to forget. Come to think of it, the scents and aromas emanating from those barns were akin to the stinky smells in the football locker room beneath Heise Park Stadium after two weeks of two-a-day practice. In fact, some of the animal barns smelled better than our locker room. At least the animals had a bath every now and then. I can’t say the same for offensive and defensive lineman. Now those guys were gross. I remember the first time I bet on harness racing at the fair. It was couple years after my first trip to the dog races in Orlando, Florida. In Orlando, I guess I looked old enough to buy my ticket — or they guy in the window looked the other way because he knew my Uncle Red. I won that day. I think it was less than $20, but it was a big thrill. I’ve never won that much in Bucyrus. I also remember the demolition derby. I was fascinated by the carnage. At the age of 10, I didn’t know the difference between an old clunker fixed up for the demo derby and a family car. For the life of me, I couldn’t figure out why those drivers were so intent on having their family cars destroyed. I had a few friends who were farmers. So they enjoyed the tractor pulls. I didn’t get it. It was just loud and smokey and greasy. Oh, and carnival rides. I hated them 40 years ago, hate them worse today. I never had the stomach for that kind of ride. Literally, if I rode something like kept going in circles, my stomach tended to empty itself. On my honeymoon, I got sick at Disney World, on Big Thunder Mountain Railroad. Yep. That was me, sprawled out on the ground and moaning like a big baby just outside the exit. So I don’t like rides. But I did like the games. And I was pretty good at some of them. I was above average when it came to busting balloons with less-than-sharp darts. But I excelled at throwing toilet paper rolls wrapped in tape through a toilet seat some 30 feet away. I always left the fair with stuffed animals or Farrah Fawcett posters and t-shirts. Unless I caught the attention of one of those cute girls in the horse barn. Then she got to take those cheap trinkets home with her. I never displayed anything at the fair. But I remember walking through all the 4-H buildings to look at the items on display, and to look for cute girls. The fair was how we met people from Colonel Crawford and Bucyrus and Buckeye Central and Wynford. There was no Facebook nor internet nor cell phones nor apps. And my friends and I always went to the big dance in the Youth Building. I guess the fair my first experience with social media.